No matter what size they are, dogs tend to love moving around and expending energy, and aren't typically interested in sitting still for more than a few minutes at a time. They're also very sensitive to the moods of their human housemates. The more you can plan, practice, and keep calm, the better your move will go. Plot out your dog's space in your new home so that you won't be constantly shuffling things around once you get there. Where will the pet bed, food and water, and leashes go? If you can, put them in spaces as similar to your old home as possible — if your dog's bed was in a corner in your previous home, try to put it in a corner in the new home as well. Give some serious thought to your transportation plans. Car rides will take longer with a dog due to bathroom and exercise breaks. Larger dogs travelling by air will have to go in the airplane's cargo bay. Senior dogs may have health concerns on longer trips. If your destination is more than a day's travel away, you'll need pet-friendly overnight accommodations lined up as well. Check in with your vet for suggestions on what your dog can handle, and whether anti-anxiety medication might be needed. Scout out dog-friendly locations. Research both your new neighbourhood and your moving route for places you and your pup can take a break, such as parks, off-leash areas, and dog-friendly cafés. If visiting these kinds of locations are part of your regular routine anyway, your dog may find them reassuring. Keep the contact information for a pet sitter or doggy daycare close at hand, plus a second one for backup. Investigate pet services such as dog walkers, groomers, and dog sitters in your new neighbourhood, and if possible, visit them to see if they suit you. Do your best to find out if your new neighbours have any young children, cats, or are afraid of or allergic to dogs. Strike up a conversation with them if you can and see if there are any agreements you need to come to on routines or when and where pets are allowed out. Look up the leash laws, pet restrictions, and whether there are any breed bans at your new home — especially if you're moving into a strata. Take your buddy for a vet checkup and get copies of any vaccination records or medications, then make sure you have a vet lined up at your new location. If you're moving between countries or provinces, make extra sure that you have the right paperwork and are aware of any deadlines. Put your cell phone number and an ID tag on your dog's collar, and microchip them if you can. Take a photo of your pup and keep it in your wallet. If your dog is already microchipped, make sure their information is up to date in the microchip database. Keep in mind that even if everything goes perfectly, some moves might be too much for your dog to go through, especially if they have health issues. It doesn't hurt to have back-up plans for re-homing your pet if it comes down to that. Start leaving boxes and luggage out around the house, empty or full, before you start the actual packing. This will help your dog get used to them, and is extra important if you travel often and your dog has come to associate the sight of luggage with you leaving. If you'll be transporting your dog in a crate or carrier, give them plenty of time to get used to it. Leave it open somewhere easily accessible, put toys, blankets, and treats inside, and make a game or have playtime around lifting it up while your dog is inside. Slowly begin to adjust any behaviours or schedules that will need to be different at the new house. Closer neighbours may mean training your dog not to bark, not having a pet door could mean a new bathroom routine, and being closer to major roadways means getting used to louder noises. If you don't have a regular schedule with your dog already, now is the time to start one: don't forget to cover food, exercise, play, training, and down time. Review any existing training and confirm that your dog still obeys important commands, and that you have what you need to keep them under control if something goes wrong. Head halters and settle-down exercises work well for many dogs. Try to bring your dog on a walk in the new neighbourhood before the move, or in locations that have similar sounds and environments. Keep an eye on whether anything makes them nervous. Dogs who have never flown on a plane before can sometimes be prepared for a flight by taking them for a car ride and going through the car wash. Talk calmly to them and pay attention to how they react to the water and whooshing noises. A few days before the move, start reducing your dog's meal portions by a third. This will make it less likely that they'll get sick while travelling. During any kind of training or new introductions, always make sure to give your dog extra attention, watch for signs of anxiety, and have lots of rewards and quiet spaces ready afterwards. Things might be busy, but now it's more important than ever not to neglect your dog's needs. Excess energy can result in anxiety, destructive behaviour, attention seeking, and other problems. Give your dog plenty of walks and play time to keep them happily tuckered out. With movers, heavy furniture, doors opening and closing, and all the usual chaos of moving day, it can be easy for dogs to get underfoot, lost, or even injured. It's best to board your dog elsewhere for a few hours or days, however long is needed. Have a family member take them for a long walk, hand them over to your regular dog sitter, or check them into a doggy daycare. If you can't arrange for a sitter, restrict your dog's access to the rest of the home. Make one room the "dog room" and keep it closed up with either a doggy gate or shut door, or put your dog in their crate until everything is finished. Try to pick a quiet room away from the worst of the noise, make sure your dog has plenty of food and water and toys, and remember to take breaks and go for walks. Hang a sign or dog toy on the door to make it clear to the movers not to leave the door open. While packing, put your dog's belongings and sleeping area away last. This keeps their part of the home the same as long as possible, makes it easier for you to grab any pet supplies that you might need during the trip, and lets you set up their spot right away in your new home. Remember not to box up any food or medication that you'll need for the trip itself. Dogs can be incredibly sensitive to the moods and stress levels of their humans, including tense body language. If you're stressed out about the move, odds are they will be too. If you can maintain a happy — or at least calm — demeanour even when things go wrong, it should help keep your dog's anxiety to a minimum. Your dog might not understand the words, but talk to them anyway: about the upcoming move, where you're going, and what the new place will be like. This helps project your calmness while giving them extra attention. Take it easy: If you give yourself plenty of time to pack and don't pull all-nighters, your positive mood will be more genuine. Plus, your dog will appreciate the more regular routine. Don't expect perfection! If things get so bad that you can't keep calm, do your best to fake it until you aren't in sight or hearing range of your pet. Always use a calm voice when speaking directly to your dog. When packing up the car or your airline luggage, arrange items so all of your dog's needs will be on hand: Food, water, favourite toys, extra towels, and bedding. Don't wash your dog's towels and blankets beforehand — the familiar scents will help keep them calm. If your dog responds well to anti-anxiety gear like ThunderShirts, wrap them up in one for the trip. 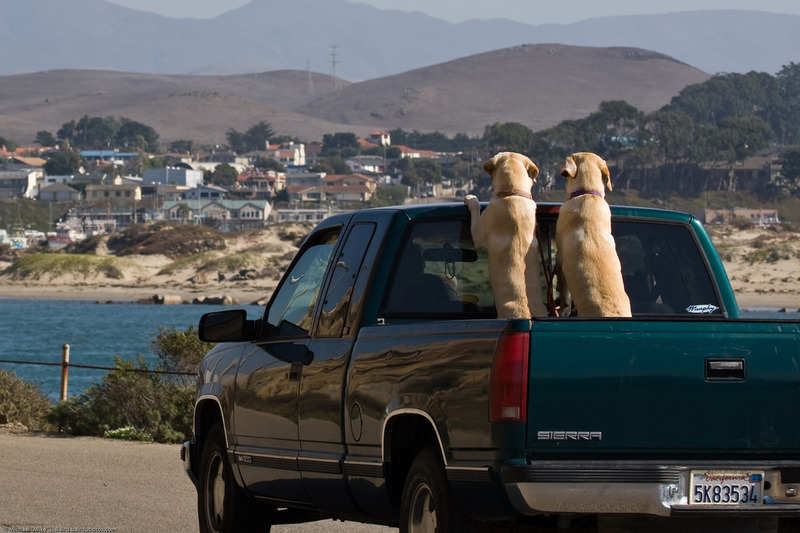 As everyone piles into the car, put your dog in last to reduce the risk of jitters and overheating. Check that your dog has enough ventilation, and will be secure when the car is in motion (doggy seat belts can be a great safety investment). If you're using a pet crate, try covering it with a light blanket to hide the passing scenery. Once your dog has calmed down you can remove it again. Do you normally like to drive as many hours as possible before you stop? That’s not best for your dog, who should get out to stretch his legs and take a bathroom break every four to six hours. As you unpack it might also be advisable to restrict your dog’s access only to those rooms that are already set up. If you want to have your dog accompany you in the unpacking area, be certain that the dog is well supervised or entertained with some enjoyable distractions (treats, favored toys). As dogs are strongly scent oriented, the opportunity to investigate new odors, to identify familiar odors and to spread their own odors gradually through playing and exploring of each room can be an important aspect of becoming familiar and comfortable with the new home. The pheromone diffuser, AdaptilTM might help your dog to more quickly settle into its new home. Before you let Humbert explore his new home, inspect it first to make sure no health hazards have been left behind, including cleaning products and rat poisons he can ingest, or holes in cabinets or walls where he can hide. Then open the crate, and let Humbert investigate at his leisure. Once you’ve finally arrived at your new home, bring in your pet after most of the furniture and large items have been moved in. A house full of familiar items and smells will be much more reassuring to your dog and easier for them to adjust to. Be sure to unpack all the pet items as well, so everything feels “just like home”. Also, let them roam around a bit and discover the new digs – with your supervision, of course. It’s likely some things will change in the new home, but try to stay as close as possible to your previous routine. If you’ve switched time zones, jump right into the new schedule like it didn’t even happen. Still go for that 9 a.m. walk in your new location – even if it may feel like 11 a.m. to your dog. When movers arrive with your belongings, segregate the dog again in a crate or a safe room. If possible, set up furniture in a familiar pattern, which will be less stressful for dogs and people, and re-establish a familiar feeding and potty schedule. In other words: If your dog is used to sleeping with you, don’t try to establish a new normal directly after a move — snuggle up and give your four-legged family member time to adjust. When moving, your gut instinct may be to get everything fresh and new – but stop at your dog’s items. Keep them smelling just like your pup. That familiar scent can help him feel more at home in a new location. Make their new world fun: Gall, who moved with her Rottweiler and cattle dog from a farm to an apartment, uses mental stimulation to tire her active dogs. Her suggestions include hiding food around the house (only where you want the dogs to be) and feeding them from Kongs or food-dispensing toys. Brain games help too. Humphrey is a big fan of Nina Ottosson puzzle toys. "If a dog bed or crate has been used in the previous home, then this may help the dog to better adapt." Your dog should be provided with an environment which has all the amenities and as much similarity as possible to the previous home, especially with regard to the dog’s sleeping, feeding and play areas. Therefore if the dog does not have a specific bed for sleeping or a specific location for eating it might be helpful to establish these before moving, and then to set up the similar sleeping, bedding, and feeding routines when moving into the new home (see Enrichment, Predictability, and Scheduling). it is best to accompany the dog to these areas and spend some time with the dog in the new home for the first few days until it has developed some familiarity with its new environment. Young dogs in particular that are given the opportunity to explore new areas may have a propensity to chew as part of their investigative behavior, while some dogs may tend to mark their territory with urine. Therefore, accompanying the dog while it explores provides an opportunity to encourage and reinforce desirable behavior while interrupting or deterring undesirable behavior. There is no easy answer to this question as every dog is an individual and will react differently to the challenge of a new home. Most dogs start to relax within a few days of moving, but there are some that immediately seem to enjoy the stimulation of exploring a new environment and others that take weeks to adjust to their new environment. If the routine in the new home is significantly different from the previous home, then it will take time to develop a new routine. Play toys, affection sessions, and food treats can help the pet to make the move to the new home a positive experience, as long as they are used to reinforce acceptable responses (calm, relaxed, inquisitive). For example a few new play toys and a special treat given when the dog appears calm or settled into its favored sleeping area can be very helpful in encouraging the pet to settle down and relax. Be certain to offer regular periods of play and exercise to ensure that the dog’s social and energy needs are met. When first leaving the dog alone in the new home, it would be best to match the time when you depart with a time when the pet is normally sleeping or playing with its own toys, and increase time alone gradually, allowing the dog to adapt. You want your new contact information on your dog stat. Being in a new place can increase the chances that your dog bolts and gets lost. Ask for recommendations from neighbors and co-workers, and get your dog in for a check-up. Getting your dog in before an emergency situation arises can help him get to know the new vet in a relaxed way. Especially if you spend a lot of time outdoors, find out if there are any region-specific vaccines that your dog may now need. Along with a vet clinic, be on the lookout for other services you may need, like a dog walker, a doggy daycare, and a great groomer. A good pampering just might help alleviate some of your dog’s stress from relocating. Before moving day, spend a few hours in your new neighbourhood and check out the area for green spaces and off-leash dog parks. If possible, bring the dog along to help him get to know the surroundings, plan out the walking route, and perhaps make a few new friends. Off-leash areas are becoming increasingly popular and many neighbourhoods have at least one of them within walking or short-driving distance. Dog parks play an important part in socializing your dog, especially when moving to a new neighbourhood. It’s also a great place to meet and befriend your neighbours. If you’re not sure whether your neighbourhood has an off-lease area, you can find out on the City of Toronto website. When finding a new vet, try to set up an appointment as soon as you move in. It is important to make sure that you are comfortable with the clinic’s practice before an emergency occurs. Unlike dogs, most cats are perfectly fine with curling up and napping for hours at a time. This would be great for travelling... if they didn't tend to be more anxious about moving vehicles and new spaces. Cats may be more reticent and take their time getting to know this strange place you’ve dragged them to, so be patient and don’t rush them. Cats don’t like change. They’re also territorial so imagine how they must feel when they suddenly find themselves in a totally unfamiliar location. Confirm that your cat can travel in the airplane cabin with you under the seat in front of you; avoid transporting your cat in the cargo/luggage hold at all cost. Identify the precise dimensions under the airline seat as this will dictate the size of your transport carrier. Determine what paperwork you must have in preparation for travel including vaccination records and a health certificate for travel. If your cat is allowed outdoors, start keeping him indoors at least a week before the move. With all the packing and commotion associated with moving, it’s not unusual for a cat to get nervous and disappear while outside. Acquire your cat’s travel carrier well in advance of your trip. Consider a soft-sided travel carrier as it is more “forgiving” for fitting under the airline seat space or in car seats. Have the carrier open and available at all times in order to make it as unintimidating as possible. Teach your cat that the carrier is a great everyday place to hang out; feeding your cat in the carrier can create a positive association. If your cat is reluctant to enter the carrier to eat, start by just placing his dish next to it. After a few days, put the dish just inside the carrier, right near the opening. Then, over a week or two, gradually move the dish toward the back of the carrier so your cat has to step a little further inside each day. Eventually, place the dish at the very back of the carrier to your cat must go all the way into it to eat. Practice entry and exit from the carrier to make it as routine a process as possible – this will be important during security screening. Reward her with a treat each time that she goes in the crate, and/or place a blanket over the carrier to make it look like a safe hideaway to your cat, which will be helpful on moving day. You can also use treats and offer a special treat in front of, next to, on top and then inside the carrier. Clicker training is also very helpful for teaching cats to accept being in a carrier. Schedule a visit with your veterinarian close to the date of travel. Be sure all relevant vaccinations are up to date, and plan to have your cat’s rabies vaccination certificate handy when traveling. Ensure that your cat is up to date on vaccinations and parasite control. Moving is a stressful process for your cat, so you will want to make sure that she is as healthy as possible. While you are at the veterinarian's office, ask for a copy of your cat’s medical records. This is especially important if you will need to switch veterinary offices after you move. Having a copy of your cat’s medical records will make it easier for the new veterinarian to know your cat’s full medical history. Traveling on an empty stomach minimizes the risk of nausea and vomiting, so withhold breakfast on the day of travel (but offer a treat at her usual feeding time to keep to routine). Line the carrier with an absorbent “puppy potty pad” in case your cat needs to urinate or defecate during travel. Carry extra pads as well as a couple of zip-lock food bags, some paper towels, and a few latex examination gloves for any necessary cleanup and containment of a mess. Carry some of your cat’s food with you, and don’t forget any medication she takes. A Thundershirt® which swaddles the cats much like swaddling an infant and can reduce anxiety. Feliway® pheromone wipes and spray to prepare the carrier and contribute to lowering anxiety. A pheromone calming collar to contribute to lowering anxiety. Talk with your veterinarian about anti-anxiety medication. Depending on your cat’s temperament, she may need medication to reduce her anxiety during the move. Your veterinarian can discuss what medications are available and how you should administer them, if necessary. Be sure to provide a dose at home as a “dry run” ahead of your trip in order to know how your cat will react to the medication. Check your cat’s ID tag. Although you will do your best to prevent your cat from getting spooked and running away during the moving process, she may still find a way to bolt. Proper identification will be very useful if someone finds her. Make sure that her ID tag has your mobile number on it, since your landline number will change after the move. If your cat is not already microchipped, take her to the veterinarian to have that done. A microchip is a small device that is implanted just under the skin. If someone finds your cat, they can take her to a veterinarian’s office or animal shelter that can scan the microchip and identify you as her owner. Preparing ‘lost cat’ flyers is also useful. These flyers should contain a picture of your cat, your cat’s profile, the addresses of your veterinary clinic and local animal shelters, and your contact information. If your cat does run away, having the flyers already prepared will allow you to quickly start posting them in the area. Find a pet-friendly hotel. If you are traveling cross-country with your cat, you will probably need to spend the night at a hotel. Finding a hotel that accepts cats may be challenging, though, since not all pet-friendly hotels accept cats. Even if the hotel accepts cats, it may not have pet-friendly rooms available when you are moving. In addition, pet-friendly hotels could charge you an expensive convenience fee. When you arrive at the hotel room, cat-proof the room as much as you can before letting your cat out of her carrier. The room will be unfamiliar to her, and she could easily find a place to hide or crawl under (under or behind the bed, under a chair). It may be best to keep your cat in your hotel room's bathroom, and set up the room as you did when you moved out of your old home. Leave her carrier in the bathroom with her. Start getting your cat comfortable with her carrier several weeks prior to the move. You can use either a hard-top or soft-top carrier. The hard-top carrier is more sturdy, but you may need the soft-top carrier if you are flying to your new destination and plan to carry her with you on the plane. If you're driving, start with placing her in the car with you without driving. When you see that she can remain calm in the car when it's not moving, take her on short drives, then longer drives. Reward her with treats each time that she stays calm in her crate while she’s in the car with you. 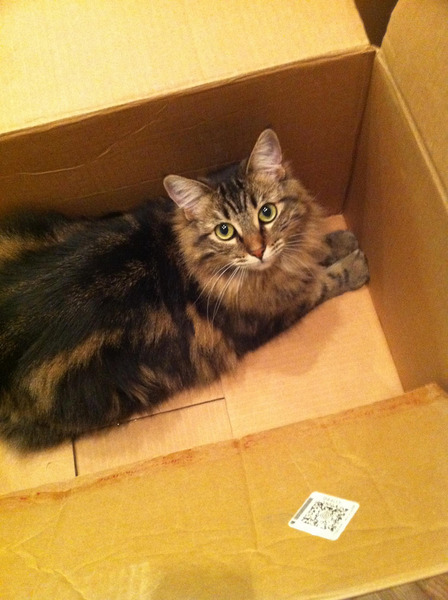 Get your cat comfortable with the moving boxes. The sight of moving boxes may be enough to make your cat very anxious. In the weeks before the move, set out some empty moving boxes for her to explore and get comfortable with. If she seems extra wary of the boxes, try spraying some cat pheromones (available at your local pet store) on the corners of the boxes; the scent of these pheromones should encourage her to explore the boxes. Giving her time to explore the boxes can end up being play time for her, which will help reduce her anxiety with the move. Keep your cat’s routine consistent. Preparing to move means that you will be busy packing boxes and running errands. Even with these changes in your schedule, make sure that you keep your cat’s routine as consistent as you can to reduce her anxiety with the move. For example, continue to feed and play with her at the same time each day. If you see that she is getting increasingly anxious even with a consistent routine, you could try to increase your play time with her. Set up a cat-safe room. On moving day, people will constantly be moving from room to room and going in and out of the door. This level of commotion will make your cat extremely anxious. Keeping her in a separate room will protect her from the commotion. To make the room comfortable for her, put her food bowl, water bowl, litter box, toys, and bed in the room. Place her in the room before you start the actual process of moving. Once she is comfortably settled in the room, place a sign on the door advising people to keep the door closed. You may also want to put her carrier in the cat-safe room, since she will have become comfortable with it at this point. If you are not moving far away, you may want to consider boarding her for the day of the move. Discuss this option with your veterinarian. Make sure that you keep the carrier door closed until you are in a closed room inside your new home. Although it may be tempting to open the carrier door beforehand to soothe her, her fear and anxiety may cause her to bolt. If it is a hot day, make sure the car is well ventilated; never leave the cat inside a hot car if you stop for a break. Set up a cat-safe room in your new home. Do this before you begin unloading and unpacking your things. Prepare this room like you did before, but also place her scratching post in the room with her. Open the carrier door and scatter some treats throughout the room to encourage her to come out of her carrier and explore the room. Even after the hustle and bustle of moving day is over, keep her in the cat-safe room for a few extra days. It will probably take those extra days for her to calm down and feel more comfortable in her new environment. Spend some extra time with her in the room. You can play and interact with her, but also do quiet activities in the room, such as reading. ‘Cat-proof’ your new home. While your cat is in the cat-safe room, make sure that the rest of the home will be safe for your cat to explore and acclimate to. Make sure that there are no pest traps, since these traps contain pesticides that are toxic. Hide electrical cords, ensure that the window screens are secure, and cover any nooks where you cat may hide and get stuck. Set up multiple litter boxes throughout your home, especially if your new home has multiple levels. Place her scent around the house. To do this, put a clean sock on your hand and gently rub the sock against her cheek to get her pheromones. Rub the sock against the corners of furniture at her eye level. Place scratching posts and toys in multiple places. Your cat may be tempted to mark her territory in your new home. Having familiar scratching posts and her favorite toys throughout the home will encourage her to scratch and play with what's familiar to her and not find new areas to scratch or mark. Establish a regular eating schedule. Your cat may feel too anxious to eat much while she's getting used to her new environment. Even if she may not feel like eating, feeding her small and frequent meals on a regular schedule will help her feel some sense of normalcy and routine in the new home. In addition, the frequency of meals will increase the amount of time that you spend with her, which will also help reduce her anxiety. Feed her these meals in the cat-safe room. Establishing regular schedules for playing and sleeping will also her acclimate to her new home. Let your cat out of the cat-safe room. Give her plenty of time and space to explore her new environment. Even after a few days, she may still be anxious, so let her get comfortable at her own pace. Offer her treats as she explores and give her access to some of her favorite toys. Offer her hiding or resting places, such as cat tunnels, where she can go while she is exploring. It may be helpful to introduce her to one room at a time, rather than having her explore the entire house at once. Keep a litter box in the cat-safe room until your cat becomes acclimated to the entire home. That room will still be her sanctuary for a while, so allow her to continue using the litter box in that room for several weeks. Once your cat has settled in, you can remove that box. Alternatively, you can keep the home-base litter box but gradually transfer it to a preferable location. To make sure your cat doesn’t lose track of where it is, move the box just a foot or so away from the home-base room and toward your preferred location each day. Keep your cat indoors for a few weeks. This is important if your cat was indoor/outdoor or fully outdoors. The outdoor environment will be just unfamiliar as the inside of your new home, so letting her out too soon may cause her to run away. If you would like to let her outside, use a cat harness and leash. You can also purchase a cat-safe enclosure for your cat to be in while she is outside, which will protect her from predators. It may be helpful to scatter some of your cat's used litter around your house before you let her outside. This will help your cat feel like she's in a familiar area when she's outside and will let other neighborhood cats know that there is a new cat. If your cat was allowed outdoors in his previous home, this would be a good opportunity to make him an indoor cat. You don’t know what kind of outdoor territorial issues might be going on with other cats and he will be the new kid in town. He will also have no connection to his new territory so just letting him outside will greatly increase the chances of having him never return home. Caged pets (bunnies, guinea pigs, hamsters, mice, etc.) may seem tiny and fragile, but they can be pretty hardy on a moving trip so long as you take the right precautions. Give your pet as much attention as possible before, during, and after the move. The calmer you are, the more relaxed your pet will be. Stick to regular feeding, play, and cleaning times for as long as possible. Don't clean your pet's items right before the move; having toys or bedding that smells familiar will be comforting during the trip. Confine your pet to one room while you pack, and try to do most of the packing outside of that room. Change is scary for most pets. Feel free to spoil your pet with toys and treats, but be careful: Too many treats right before the move might make them sick, and loose toys can fly around cages and cause injuries during travel. On the day of the move only give your pet light treats, and don't feed them their regular meal until you've arrived. It's safer for small pets to travel in a pet carrier instead of a cage. Well-ventilated carriers made of cloth or plastic are best (metal can damage teeth and cause injuries). If a cage is your only option, remove all loose objects and line it with newspaper plus plenty of blankets and towels to keep your pet secure. Practice with the carrier before the move. Leave the carrier out and open with your pet when he is out of his cage for exercise. Allow him to explore and go in and out at will. Don't leave water bottles or open food bowls in with your pet. Give them fruits and vegetables high in water content instead, and just enough treats to get them through the trip. Some pets become aggressive biters when stressed. Handle your pet carefully and firmly, support their hind legs, keep your fingers away from any teeth, and wear cotton gloves or gently wrap your pet in a towel if you think it will help. Some mice and hamsters can be scruffed when they're misbehaving, or even carried in a cup. If you're travelling by air, you may need to transport your pet in an IATA (International Air Transport Association) approved carrier. Check with your airline beforehand, and ask whether your pet can go in the cabin or will be carried in cargo. If you're travelling by car, don't pack your pet's carrier in with a bunch of other boxes. This can restrict your pet's air quality and increases the risk of something falling over and injuring them. The best option is to carry the cage with you in a secure arrangement, where your pet can see you. Talk to your pet whenever you get the chance. Make them feel safe. 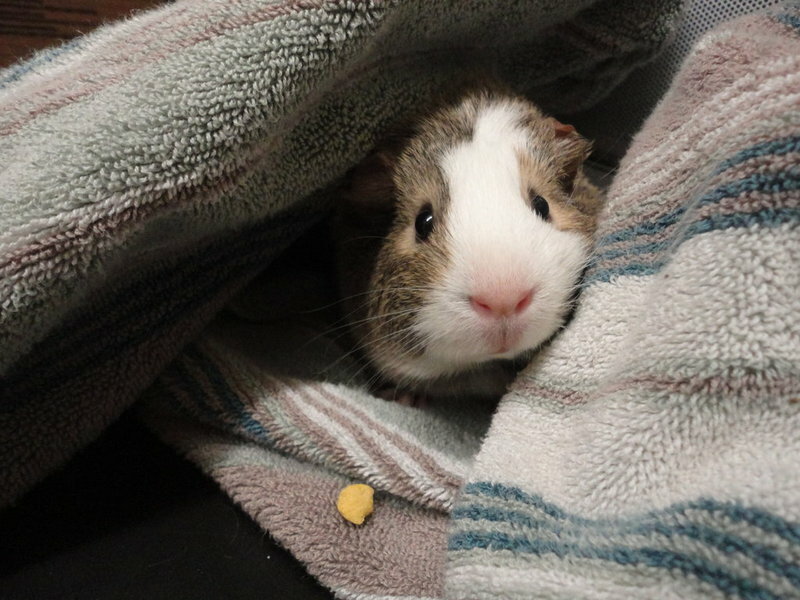 Say something like, "(guinea pig's name), you are going on a trip to (wherever) with me!" Drive safe! Accelerate, brake, and turn gradually, and go slowly over bumpy roads and potholes. You don't want to toss your pet around. Try not to travel for more than two hours at a time. Take breaks and give your pet the chance to eat, drink, and go to the bathroom, as it may be too frightened to do those things when in a moving vehicle. Do a quick check for any injuries or other problems. Do not leave your pet in the car, especially a hot car. Guinea pigs are more susceptible to heat stroke than dogs, cats, and kids. You can run the air conditioner to maintain a steady temperature, but don't allow a direct blast on your pet, and make sure they are shaded from any long periods of direct sunlight. Do not leave your pet in the car overnight. Don't let your pet out of its carrier until you've reached your destination. Odds of it running away and getting lost or injured can be high. When you arrive at your new home, get your caged pet inside and place the cage in an area with similar lighting to the spot they had in your old home. A carrying cage is not suitable housing for a pet, even if it is "just for a few nights." You might have noticed a trend by now: pets are sensitive to change and prefer routine, and birds are no exception. Like the previous tips, take things as slowly and calmly as possible. Visit your vet and get a copy of your bird's health certificates and any proof of ownership you might need. Have a new vet lined up at your new residence as early as possible, so you'll have somewhere to turn if anything goes wrong. When packing, keep your bird in a quiet room to reduce stress. Pack up any loose items one at a time until your bird is only left with essentials that won't shift or move around. Ask your vet what kind of foods or treats might give your bird some extra nutrition. This can help boost your bird's immune system and lower the chance of illness setting in during the move. Keep an eye out for any behavioural changes that might indicate stress during the moving process, such as aggression, change in feathers, loss of appetite, or excessive grooming. Water can easily spill while travelling. Just like with rodents, give your bird fruit with a high water content to snack on during your trip, rather than fresh water. As always, if flying, confirm beforehand that your airline accepts birds and in what capacity. Some bird carriers are specially designed to protect birds against turbulence on an aircraft. If you're flying to your new home, do some research on them beforehand or ask your vet if one might help your bird. Look for a car-specific bird carrier or cage to transport your bird in. They're often specially made to be secured with seatbelts and are much more secure. If you can, take your bird out for a drive in the car before the move to get used to the sensation of a moving vehicle. Bring your bird's usual food along with some of its favourite treats and toys. If your bird is especially skittish, try letting them get used to a stationary car before going on an actual drive. Don't put your bird's carrier or habitat in the front seat — if there's an accident, your car's airbag could injure your bird. Secure your bird in a back seat, and make sure all surrounding items are secure and won't move during the trip. During your trip, it's important that your bird isn't exposed to direct sunlight for long periods of time. Keep the temperature in your car as stable as possible with the A/C or heating, and have a blanket or window cover to protect your bird from the sun if needed. Once you reach your new home, get your bird settled in a quiet space as soon as possible. The more similar the setup between your old home and your new one, the easier it will be on your bird. Keep calm and watch your bird closely — a strong bond with your pet will help keep their energy positive as you move to a new place together. When moving with a reptile, never transport them to your new home in their cage. Put them into a smaller container, then put that smaller container inside a foam cooler. The cooler will protect your herp from temperature swings, light and movement, noise, and general travel risks. Bring a spray bottle and mist your reptile regularly to keep their hydration and humidity up. This is especially important for amphibians! For long trips, use heat packs to keep your reptile warm. Put the heat packs between the cooler and the smaller container, not inside the smaller container itself — you don't want your pet to suffer accidental burns. If you can't keep your reptile at a higher temperature, don't feed them during or right before the trip. Reptiles can go a few days without food, and it's better for them to be hungry than to be eating food that they can't digest. If you’re concerned about making the move yourself, there are professional pet moving services that are equipped to handle pets of all species, shapes, and sizes. Consider a specialist pet transport company so your pets’ travel is handled by experts. Although dogs and cats make up 99% of transported pets, a reputable company should be able to handle any type of animal that can be legally moved across provinces or overseas.